1 oz lot of 20. 1 oz lot of 25. 1 oz lot of 100. 1 oz lot of 500. 2018 Australia 1 oz Gold Kangaroo (MintDirect® Premier Single) - SKU#152666. APMEX individually seals each MintDirect®. Coin to ensure the authenticity and condition after the coins are removed directly from the mint boxes. This process seals the coin within the card, creating a tamper-evident package that guarantees your investment indefinitely. Learn more about the tamper-evident. Packaged in RF-welded plastic polymer case (2 1/2" x 3 1/4"), protecting the coin's finish, with included authentication card. Multiples of 10 are housed in a 10-Count APMEX® MintDirect® Singles storage box (5 x 2 5/8 x 3 1/2). Multiples of 20 are housed in a 20-Count APMEX® MintDirect® Singles storage box (10 x 2 5/8 x 3 1/2). APMEX® storage boxes hold MintDirect® or MintDirect® Premier TEP Singles and are stackable with other APMEX® Mini Monster Boxes and the APMEX® Monster Box. This process requires the coins to be removed from their original mint capsules. Obverse: Portrays the Ian Rank-Broadley likeness of Queen Elizabeth II, as well as the coins monetary denomination. Reverse: Features two kangaroos bounding across a stylized rural landscape. Also included is the year of issue, weight, and purity of the coin. Guaranteed by The Perth Mint. Secure your Gold Kangaroo by adding an attractive display box. The Gold Kangaroo offers an unrivaled combination of quality and fascinating wildlife design, which brings this Gold bullion coin series to life. Add the 2018 1 oz Gold Australian Kangaroo coin to your cart today! Each year, The Perth Mint introduces coins with the new year's date on them. New dies are engraved, prepared and deployed to strike the coins for each year. The coin dies wear down over thousands of strikes, causing the details of the engraved die that transfers to the newly struck coin to flatten, diminishing the quality of the finished coin below standards. At this point, the dies are replaced. For each minting press, new dies may be required multiple times each year. There is no public notice that dies are changed, and each minting press changes dies at different times required by die wear. Because each new year brings new dies, APMEX has designated all products delivered by The Perth Mint during the first 30 days of their issuance that go through the MintDirect®. APMEX individually seals each MintDirect® coin to ensure that the authenticity and condition of each coin is protected after they are removed directly from the mint tubes. Each coin is placed in a protective authentication card composed of a non-reactive plastic polymer to protect your coins finish. The sealing process seals the coin within the authentication card, creating a tamper-evident package that will guarantee your investment indefinitely. If the tamper-evident package has been opened in any way, you will know it. After the process is completed, the coin in the tamper-evident package is removed from the machine and checked to ensure that the quality of the packaging meets our exacting standards. 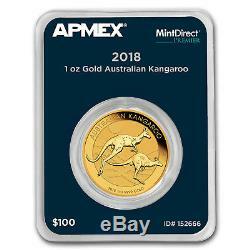 You now have a finished 2018 1 oz Gold Kangaroo MintDirect® Premier Single. By using this process, APMEX can guarantee that the coins you receive are authentic and in the exact condition as they were when they left The Perth Mint. Each package is fully insured. There are no exceptions to this rule. The UPS Store, or similar third party drop off locations. If you do not receive the package directly from the common carrier, you agree to take all reasonable actions to assist in recovery of the package, including but not limited to filling out reports (and/or police reports) and providing all information needed or that may be requested to assist in recovery of the package. A: Once your order is completed it cannot be cancelled. Please be certain of your order before finalizing. Q: Is my package insured while in transit? Additionally, if a package is signed for by the apartment/complex building management, we do not assume responsibility. Q: What do I do when my package appears to be lost? Definitions The following terms have the following meanings in these T&C: 1. The term "APMEX" means APMEX, Inc. The term "Bullion" is used to describe (1) Gold, Silver, Platinum or Palladium Coin(s) which closely follow spot prices and have little or no Numismatic value (such as restrikes); and (2) the form in which metal is shaped such as bars, ingots or wafers. The term "Coin(s)" means a stamped piece of metal of a known weight and fineness issued for commerce by a sovereign government. The term "Fair Market Value" means the Fair Market Value of the Product as determined by APMEX, in its reasonable discretion, as of 5:00 p. The term "Numismatic Coin(s)" means a Coin, the price of which depends more in its (their) rarity, condition, dates, and mint marks than on their gold or silver content, if any. The term "Precious Metal" means Gold, Silver and Platinum along with the Platinum group of elements: rhodium, osmium, ruthenium, Palladium and iridium. Precious Metals are characteristically lustrous, ductile, rare and nonreactive. The term "Semi-Numismatic" means a Coin that has both Bullion and Numismatic value. No other relationship, including, without limitation, any agent-principal relationship, any employee-employer relationship, any franchisee-franchisor relationship, any joint venture relationship or any partnership relationship, between APMEX and you exists. You may not assign any of your rights or obligations under these T&C without the prior written consent of APMEX, which may be granted or withheld by APMEX in its sole discretion. If you become aware that you may be required to make any disclosure of such information, including, without limitation, as a result of the receipt of a subpoena or other compulsory process, you shall promptly notify, in writing, APMEX and you shall cooperate, in good faith, with APMEX in obtaining a protective order or other appropriate relief, if any, with respect to such disclosure. The item "2018 Australia 1 oz Gold Kangaroo (MintDirect Premier Single) SKU#152666" is in sale since Thursday, January 25, 2018. This item is in the category "Coins & Paper Money\Coins\ World\Australia & Oceania\Australia\Gold". The seller is "apmex" and is located in United States. This item can be shipped to United States.